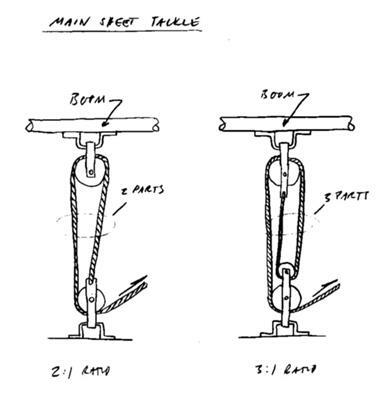 Examples of two types of tackle for a sail boat main sheet. Here is one way to make non-working blocks for static model boat. I am building a Dumas 1:12 Lightning sailboat model for display only and want to replicate the actual mainsheet rigging. I need to make or buy several "modern" sheaves e.g. Harken style with say 3/8" length without becket. Suggestions for a source or instructions? Come to think of it, I’ve never seen modern scale model blocks for sale, so I think you’re stuck making them yourself. I have to reach back to my dinghy-sailing-days, but I believe there are a few different tackle configurations to run the main sheet. For the size boat like the Dumas Lightning, I suspect a two-part or three-part tackle would be appropriate (see picture 1). The first design, the double block, has the sheaves side-by-side, as probably most people are used to seeing them. The second design (also known as fiddle block) has sheaves of different sizes where the larger is closer to the floor to permit the loops to run concentric. One benefit of the latter (model or real boat) is that you avoid twist in the tackle. Since this is a static model, we don’t need to figure out how to fit a couple of ball bearings in there. That’s a definite plus. Let's start with the easiest option first. Making the whole block from a single piece of wood. For classic ship model building, non-working blocks have been made of solid wood for ever. There is no doubt that is a viable option even for a modern block. The wood I’d use would be dense and hard: I’m thinking maple would work great. 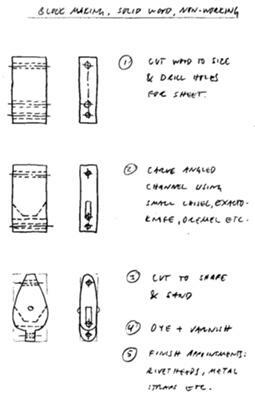 Picture 2 above, illustrates how I’d go about making a static block for a 2-part lower or 3-part at the boom. The other configurations would be similar. To make it black, the best way to stain it is to use leather dye (Fiebing’s Leather Dye works great) and then varnish. It’ll look like carbon fiber reinforced plastic in a hurry. Once shaped, dyed and varnished you can add metal straps to simulate the becket and rivet heads (cut down sewing pins). I can already hear folks asking if styrene would work. Personally, I don’t like the idea. The main sheet, even on a static model, will see some stress over time. Add to that the habit of styrene going brittle as it ages. It will break eventually. If you happen to have exotic wood scraps lying around (and know how to work it), ebony, rosewood, boxwood or holly would work well too. A semi-working block can be made from thin aluminum or brass sheet metal for the becket and a home made sheave made of wood. Thin sheet metal, say .015” and thinner, can be cut with regular scissors – the thinner the easier naturally. The sheet metal can be found in hobby stores and some crafts and art supply stores. Don’t have a lathe? Don’t sweat. If you have a 3/8” or larger drill motor (corded or cordless) you should be able to chuck a wooden dowel of appropriate size. To do this effectively, you need some sort of holder or clamp for the drill. I don't recommend sticking it in a vice though. I know it's tempting, but it's also too easy to crush the drill. Make a dedicated holder or buy a commercial unit. They are available in woodworking stores like Rockler and WoodCraft. Use needle files to shape and cut the wood. It may not come out perfect the first time you try it, but desperation is after all the mother of invention. For final shaping, you can use sandpaper or my favorite: Scotch-Brite pads. I use the green and burgundy a lot. To cut off when the piece is done, use a hacksaw or X-acto saw. It is easy to ruin the piece at this point. Going slow on the drill is essential. Please use caution and safety glasses when using power tools. Once you have completed the main sheet I’d love to see pictures of how it turned out! Use the comment function or contact me through the "contact me" page.